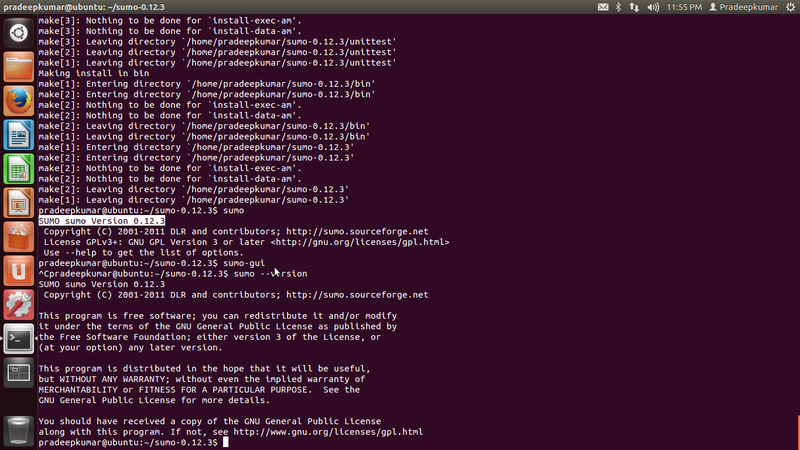 This post will tell you how to install SUMO 0.12.3 version in Ubuntu 12.04 LTS. 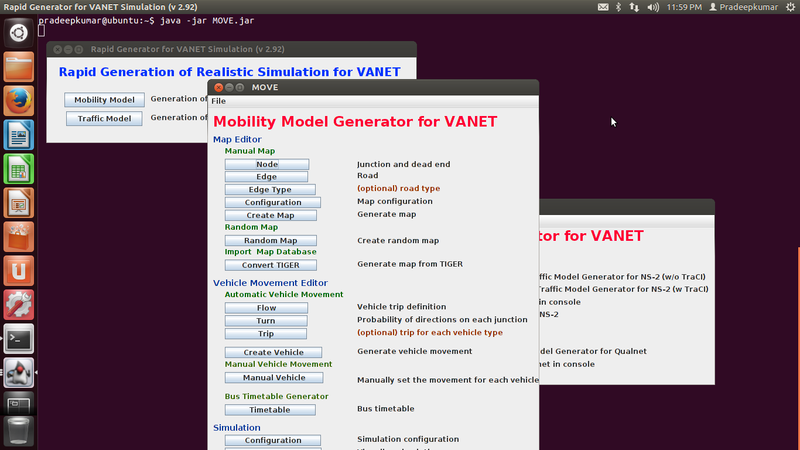 Also this post will tell you how to use MOVE for generating VANETs Simulation scenario. (Also MOVE.jar will support only SUMO 0.12.3). The latest version of SUMO (at the time of writing this post) is sumo 0.21. Its always better to use the latest software, but to begin with SUMO needs XMl files are roads, edges, vehicle routes, etc. So MOVE.jar file is just helping in creating the xml files needed by SUMO. But the recent versions of SUMO (0.21) and etc, the XML files are to be generated manually by means of any external xml editors or simply using gedit or vim. Also, the Ubuntu package manager comes default with sumo and sumo-gui command (that can be installed using the command sudo apt-get install sumo , but the python scripts like randomTrips.py, traceExporter.py etc may not work for creating the routes, vehicles, etc. 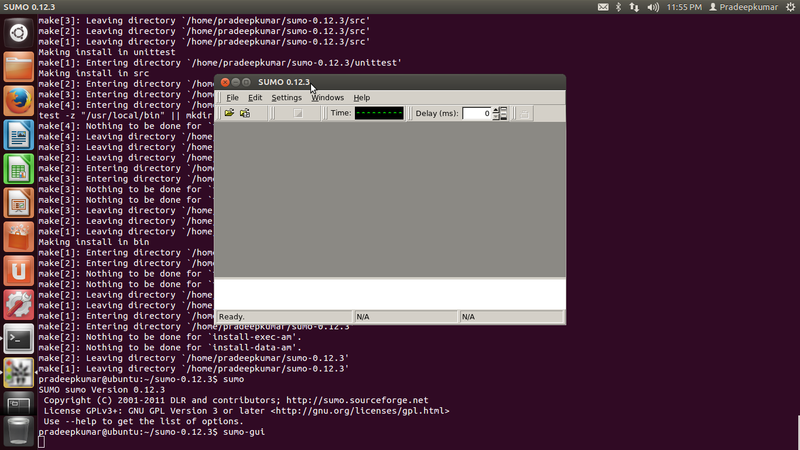 So compiling from the source is the best option for installing SUMO in Ubuntu. See the screenshot below for successful installation of sumo and sumo-gui. Now you can create the simulations using MOVE and SUMO. Here is the screenshot of all the three windows for MOVE. Thats all about the MOVE installation. My next post will be about the creation of xml files using MOVE and to generate traffic files for NS2. When i am trying to use the sumo installation . i am getting the following errors. Can someone help me install SUMO 0.12.3 version in Ubuntu 12.04 LTS (32 bits)? I had already installed it, but the command sumo-gui doesn't work. The sumo-gui wasn't installed and I don't understand why.